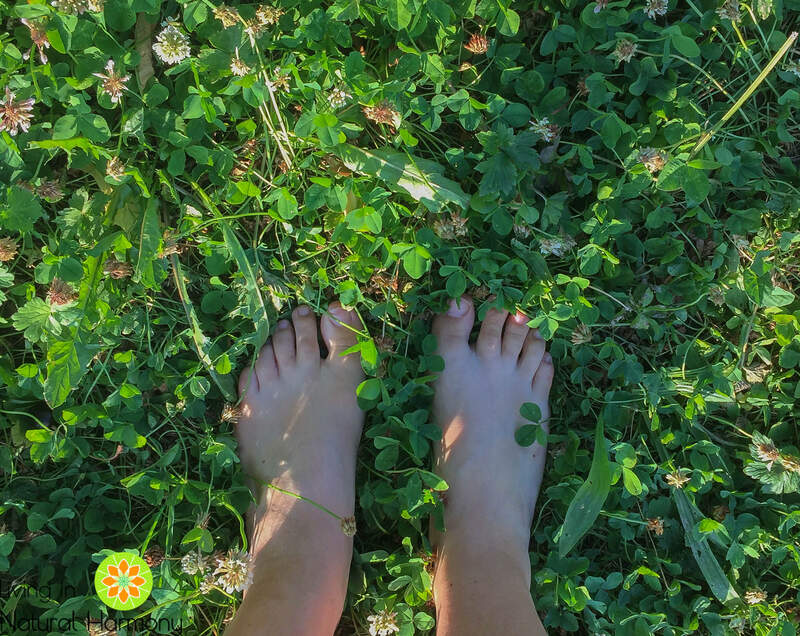 Grounding or earthing refers to the simple act of placing our bare feet on the natural ground, such as dirt, sand or grass. By doing that, we are in direct contact with the Earth. The surface of the Earth is charged with electrons , which are absorbed through our feet when we are grounded. It has been suggested that these free electrons, which are negatively charged, will neutralize the free radicals in our body, which are positively charged . These free electrons could thus function as antioxidants and they may be beneficial to counteract inflammatory-related diseases . Chronic inflammation is increasingly recognized as the culprit behind most of the modern chronic illness. The majority of us wear shoes with rubber soles all the time, and therefore, we are completely isolated from the ground the whole day – meaning ungrounded. This is not natural for our body, as during millennia people have been walking barefoot or with shoes that allowed them to be grounded (mainly made out of animal skins; synthetic rubber was just discovered in the past century). Many people also slept on the ground or on skins. If you think about it, our whole body is electrical – from the functioning of our heart to the functioning of our brain. So, if we have to ground electrical equipments, why shouldn’t we have to be grounded ourselves if we are “electrical beings”? I know what some people might be thinking at this point, I was there too. But it did make sense to me and then, after looking at the scientific studies that have been performed on grounding the human body, I do think that grounding is a very important part of a healthy lifestyle. So let’s look at what the science has been showing. The influx of free electrons absorbed into the body through direct contact with the Earth may neutralize reactive oxygen species (also known as free radicals), thus acting like antioxidants, reducing acute and chronic inflammation. Grounding has been shown to reduce the signs of inflammation following injury, such as redness, heat, swelling, pain and loss of function . Besides this “visible” form of inflammation (following an injury), it has been suggested that grounding also prevents or reduces the “silent” chronic inflammation in the body , which is a well-known cause of many chronic diseases. Connecting the human body to the Earth during sleep has been shown to normalize the circadian rhythm of cortisol, also known as the “stress hormone” . In this study, all the participants slept grounded for 8 weeks. Grounding during sleep was achieved by sleeping on a conductive sheet connected through a cable to a grounding rod placed outside in the soil. The subjects in the study also reported improved sleep quality, pain and stress levels after these 8 weeks. A double-blind study including 40 adult subjects who were either grounded or sham-grounded (meaning, they thought they were grounded but they were not) for 1 hour, while relaxing in a comfortable chair, found that pleasant and positive moods were statistically significantly improved in the grounded group but not in the sham-grounded group . This showed that grounding improved mood more than relaxation alone. A study on muscle damage after eccentric contractions (200 half-knee bends) demonstrated that grounding can help reducing muscle damage . The participants that were grounded after this exercise for 4 hours (on the day of the exercise and the day after) had a significant reduction of creatine kinase (CK; a marker of muscle damage) from the injured muscles, which indicated reduced muscle damage in these participants compared with the sham-grounded participants. In fact, grounding has been used to accelerate muscle recovery and wound healing after strenuous exercise, for example, during the famous cycling event Tour de France . A study showed that grounding during 2h lead to an increased surface charge of red blood cells, reducing blood viscosity and red blood cell aggregation . Thick blood is a risk factor of cardiovascular disease and so in this study the authors argue that grounding could be a simple way to help reducing cardiovascular risk events. The sympathetic nervous system is the branch of the autonomic nervous system that allows us to enter in the “fight-or-fly mode” when we are in the presence of a dangerous or stressful situation. On the other hand, the parasympathetic nervous system is activated when we are more relaxed. Nowadays, with our stressful lives, our sympathetic nervous system is often overactive. So, it is important to find ways to activate again our parasympathetic nervous system. Many people achieve this through relaxation techniques, meditation or exercise, to name a few strategies. Grounding might also be a useful strategy to shift the autonomic nervous system from sympathetic to parasympathetic activation. In a double-blind study, half of the participants were grounded for 2 hours and the other half were sham-grounded for the same time . The researchers noted that during grounding there was 1) an immediate decrease (within a few seconds) in skin conductance and an immediate increase after ungrounding; 2) an increase in the respiratory rate; 3) a stabilization of the blood oxygenation; and 4) an increase of the variance of pulse rate . The immediate decrease in skin conductance observed, indicates a rapid activation of the parasympathetic nervous system and corresponding deactivation of the sympathetic nervous system. The researchers suggest that the increased respiratory rate, the stabilization of blood oxygenation and the slight rise in the heart rate indicate the start of a metabolic healing response which may need an increased oxygen consumption . The heart rate variability (HRV) is the variation in time between heartbeats and is controlled by our autonomic nervous system. The HRV is a simple measure to identify autonomic nervous system imbalances. For example, if we are stressed (flight-or-fly mode), the variation between heartbeats is low, and when we are relaxed, this variation is high. A low HRV has been associated with depressive and anxiety disorders as well as a higher risk of cardiovascular diseases [11, 12]. Meditation, sleep and physical activity have all been shown to increase HRV. Grounding may also be another strategy to increase HRV. In a double-blind study in which participants were their own controls (meaning that they were first grounded during 2h and then they repeated the session but ungrounded – but they didn’t know in which of the sessions they were grounded) found that during the grounded sessions participants had a statistically significant increase of HRV . As an improved HRV is a positive indicator on cardiovascular status, the researchers suggested that grounding could be used to support the cardiovascular system . You can ground simply by walking bare feet on natural ground, especially when the ground is wet (more conductive). In fact, walking bare feet on the beach is the best grounding you can get as salt water is very conductive. If you live far away from the beach, you can also simply walk or exercise on the grass or soil (especially conductive if it is wet). Be aware that asphalt, wood, rubber and plastic are not conductive, and therefore you are not grounded even if you walk barefoot in these types of surface. There are also nowadays some commercially available “grounding shoes”. But of course we cannot be the whole day outside grounding, so another way to ground inside is to have grounding pads or sheets connected through a cable to a grounding rod placed outside in the ground or to the ground of our sockets (these systems are commercially available). You can work for example with your bare feet touching one of these grounding pads or sleep on one of these grounding sheets. The floor of ground floor houses that is made out of ceramic tiles is in principle also conductive. Concrete can be a conductor as far as it has not been sealed with paint or other materials. Another simple way to ground at home is to touch the faucet while you brush your teeth or do something else (but of course you cannot do this during a long period of time). Some people have claimed that it might not be optimal to connect our grounding pad to the socket of our house as this could connect us to the electrical noise circulating in the electrical wiring of our house. These claims have not been scientifically proven. I have spoken to electrical engineers who told me that as far as the grounding cable connected to the socket has a resistor (they normally have one of 100 kΩ) there shouldn’t be any problem. If you do that, you should just confirm that the ground of your socket is working – for that there are testers commercially available. While the majority of studies I referred above were performed with grounding rods placed outside, a very recent double-blind randomized controlled trial study published this year (2018) found very positive results using a grounding system connected to the socket .They found that people who were grounded for 4 weeks during work (massage therapy) and sleep had an increased HRV and a lower blood viscosity . So, if you have the opportunity to place a grounding rod outside in the Earth, that is great, but if you don’t, connecting a cable (with a resistor) to your socket could be a good option. But of course, always listen to your body and if you don’t like to be grounded through the socket, try to find other means to be grounded (grounding rod placed outside; walking barefoot outside, etc). In the studies I mentioned in this article, the grounding sessions lasted a minimum of 1-2 hours. However, I would say that if you cannot ground for so long, some minutes grounding is better than nothing. While grounding should not be considered a treatment for a particular disease, all the research and empirical evidence until now indicates that grounding is an important component of a healthy lifestyle to help preventing diseases and also reducing immediate symptoms of inflammation or pain-related illnesses. If you would like to know more about grounding/ earthing, I recommend you read the book Earthing by Clinton Ober, Stephen Sinatra and Martin Zucker. Williams, E. and S. Heckman, The local diurnal variation of cloud electrification and the global diurnal variation of negative charge on the Earth. Journal of Geophysical Research, 1993. 98(3): p. 5221-5234. Chevalier, G., et al., Earthing: health implications of reconnecting the human body to the Earth’s surface electrons. J Environ Public Health, 2012. 2012: p. 291541. Oschman, J.L., Can electrons act as antioxidants? A review and commentary. J Altern Complement Med, 2007. 13(9): p. 955-67. Oschman, J.L., G. Chevalier, and R. Brown, The effects of grounding (earthing) on inflammation, the immune response, wound healing, and prevention and treatment of chronic inflammatory and autoimmune diseases. J Inflamm Res, 2015. 8: p. 83-96. Ghaly, M. and D. Teplitz, The biologic effects of grounding the human body during sleep as measured by cortisol levels and subjective reporting of sleep, pain, and stress. J Altern Complement Med, 2004. 10(5): p. 767-76. Brown, R., G. Chevalier, and M. Hill, Grounding after moderate eccentric contractions reduces muscle damage. Open Access J Sports Med, 2015. 6: p. 305-17. Ober, C., S. Sinatra, and M. Zucker, Earthing: the most important health discovery ever! 2014: Basic Health Publications. Chevalier, G., The effect of grounding the human body on mood. Psychol Rep, 2015. 116(2): p. 534-42. Chevalier, G., et al., Earthing (grounding) the human body reduces blood viscosity-a major factor in cardiovascular disease. J Altern Complement Med, 2013. 19(2): p. 102-10. Chevalier, G., Changes in pulse rate, respiratory rate, blood oxygenation, perfusion index, skin conductance, and their variability induced during and after grounding human subjects for 40 minutes. J Altern Complement Med, 2010. 16(1): p. 81-7. Gorman, J.M. and R.P. Sloan, Heart rate variability in depressive and anxiety disorders. Am Heart J, 2000. 140(4 Suppl): p. 77-83. Buccelletti, E., et al., Heart rate variability and myocardial infarction: systematic literature review and metanalysis. Eur Rev Med Pharmacol Sci, 2009. 13(4): p. 299-307. Chevalier, G. and S. Sinatra, Emotional stress, heart rate variability, grounding, and improved autonomic tone: clinical applications. Integrative Medicine: A Clinician’s Journal, 2011. 10(3). Chevalier, G., et al., Effects of Grounding (Earthing) on Massage Therapists: An Exploratory Study. Health, 2018. 10: p. 228-250. I have been aware of and practicing grounding for quite a while. In Florida I did alot of barefoot beach walking, and now here in CO. I’m trying to eradicate the Canadian thistle in my yard so it is not so painful to ground while I tend my garden full of leafy greens. It is such a joy to go out there barefoot, while the ground is still wet from dew, and pick the kale, chard, and spinach for my morning smoothie. I don’t even wash it…I drink it within 30 minutes of picking, and I can feel the sunlight’s energy coursing through me ! Dr. Mercola has a whole podcast library on grounding, along with a host of grounding tools in his store. That’s so great! I also love to ground in my garden 🙂 and the weeds in between the vegetable beds are super comfortable for the feet!